How are volleyball attacks distributed on court, by starting and ending location? Figure 1: (a) Attack rate and (b) attack success rate, by starting and ending zones of attacks. The lower half of the figure shows the starting location of attacks, and the upper half shows ending locations. 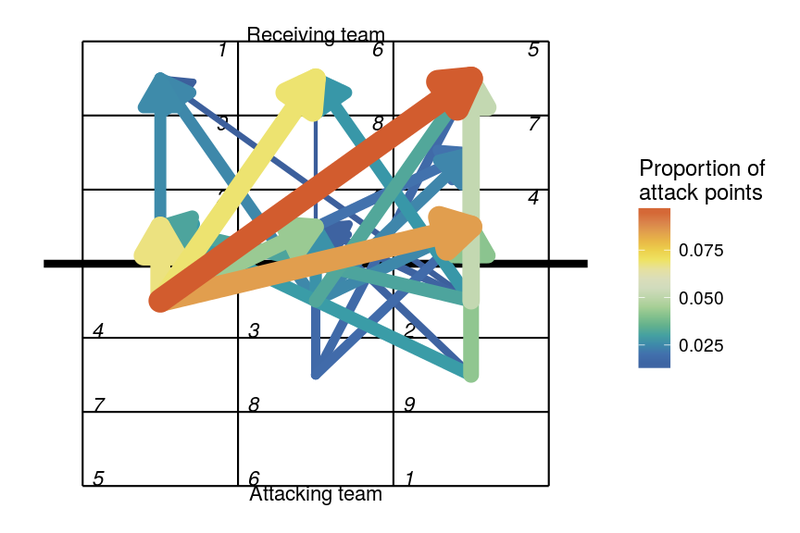 Most commonly (43% of the time) attacks are made from position 4, with most of the remainder from the middle (position 3) and right side (positions 2 and 9). The ending location of attacks is most commonly the left (positions 4 and 5) with most of the remainder the other two front row blockers (positions 2 and 3) and deep middle (position 6). However, while attacks from position 4 are the most common, they are not the most successful. Middle and right-side attacks generally have a higher win rate. We can also show this information in more specific detail, using arrows to depict the starting and ending location of attacks. Note that the right-hand panel in the figure only shows attacks with attack rate of at least 1% (i.e. excluding those attacks that make up less than 1% of all attacks). Attacks with the highest success rate include angles from the middle (front row) hitter, and outside hits down the line (from position 4). And, not surprisingly, the majority of attack points are scored from position 4, with the most fruitful attacks being cross-court hits to positions 5 or 4. See https://github.com/raymondben/datavolley for an R package for reading and analyzing DataVolley scouting files. Posted on Monday August, 08 2016 at 19:19:00 .